All of us are familiar with registering our vessels with the State Department of Motor Vehicles. Like a car, DMV wants to know her horse-power, fuel type (gas or diesel) and the Hull Identification Number, or HIN#. This is the on-the-water equivalent of a car’s VIN#. You are required to display on each side of the bow the state registration numbers, followed by the expiration sticker itself. But is your boat eligible for documenting with the USCG and, if so, should you? This is what this column is about. The HIN is the unique 12-digit identification number of the vessel. It is emblazoned on the starboard side of the transom and it is, as you would expect, illegal to alter it, paint over it, obscure it or in any way make it seem like you’re trying to make it look like a different HIN#! This number indicates the boat manufacturer, its serial number, and the month and year of production. This one item is of critical importance during any vessel safety check or exam. If the HIN# on your State registration doesn’t conform to the vessel’s physical HIN#, you would be required to resolve that immediately. So Why “Document” the Vessel? First, for the USCG to permit documenting the vessel, it must adhere to a certain formula for its “admeasure” – not what it weighs but really what it can carry in cargo. Its “admeasure” must be at least equal to 5 net tons by the USCG formula. As a rule of thumb, boats less than 25’ in length are unlikely to measure up. But, there is a simplified formula that the USCG provides (Form CG-5937, Application for Simplified Measurement) that you can access online that can determine if the boat qualifies. She must be less than 79’ to fit into the simplified window but I expect that this isn’t a problem for most of us! 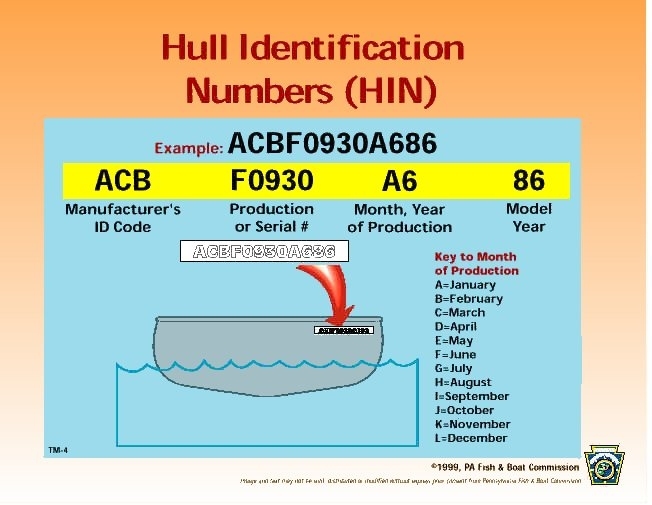 Documentation numbers need to be permanently attached to a structural portion of the hull, and the vessels' name and home port need to be listed on the hull--usually the transom. Recreational vessels must have the name and hailing port listed in 4 inch letters. Commercial vessels must do the same, but they must also have the name on both sides of the bow. Tons come in many shapes and sizes – short tons, long tons, metric tonnes, gross tons, net tons, displacement tons, deadweight tons, register tons, US and international regulatory tons – and tuns. A tun, going back in history, was a wooden cask full of wine. To be precise, it had to hold four “hogsheads” of wine – which is 252 gallons. Vessels were measured and taxed by how many tuns of wine that they could transport. Guess that a tun of wine weighs..? About 2,200 pounds – and this is where it starts to get interesting or complicated, depending on how your brain works! The “ton” we all learned about in school is 2,000 pounds. In maritime parlance, this is a “short ton”, with a “long ton” being, yup, about 2,200 pounds. It is 2,240 pounds to be precise or just about what a tun of wine weighs. Of course, most of the world is on the metric system so a metric ton – or a tonne - is 2,205 pounds but, as best as I can determine, this is coincidentally about what a tun of wine weighs. The reason that they are so close is because the metric ton, or tonne for short, is the weight of 1,000 liters of fresh water – and wine is mostly fresh water! Displacement tons and deadweight tons can come in all three flavors – short, long and metric. Suffice it to say that it is complicated. One last tidbit… Above, I referenced that tuns were used to measure and tax vessels “back in the day” of sailing ships and bootleggers. The agency that Alexander Hamilton created to police these policies on US waters was the Revenue Cutter Service. This service became, over the centuries, what we now know as the United States Coast Guard.